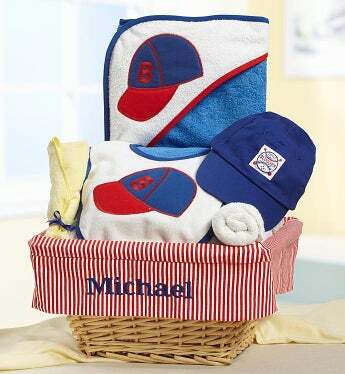 Before or after their new baby boy slides into his new home, send the little slugger this 100% cotton layette gift basket! The proud new parents and their little bundle of joy will love the high-quality, 100% cotton layette that features everything they need to care for their newborn baby including a real wicker lined gift basket with embroidered baby’s name, hooded terry cloth bath towel, and terry cloth bib with baseball cap embroidery, terry cloth washcloths rolled to look like a bat and ball and a super cute Infant Baseball Cap. Before or after their new baby boy slides into his new home, send the little slugger this 100% cotton layette gift basket! This gift comes in a real wicker, fabric-lined gift basket with name personalization.